What's wrong with this picture? Or is it just me? This seems awfully like a 'visible hand' regulating the market. 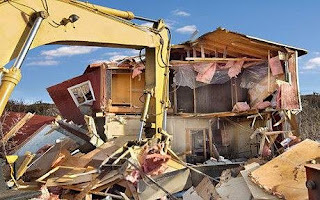 US cities may have to be bulldozed in order to survive. The US government is looking at expanding a pioneering scheme in Flint, one of the poorest US cities, which involves razing entire districts and returning the land to nature. I have finished my review of "Less is more" and I'm happy to announce your blog will appear on Blogging Women. "This was a factory, now there are mountains and rivers... there was a shopping mall, now it's all covered with flowers..."
I think this is a great idea. They should've done that to New Orleans after Katrina. Ty Fay for you kind feedback. Words such as yours keep me going. I had almost given up on hearing from you; but I shall repost the url to your site within the week.